HomeShop by CalendarMen's Health Awareness MonthBlue Awareness ProductsRectal Cancer Awareness"Colon Cancer Awareness" Blue Rubber Bracelet Wristband - Adult 8"
"Colon Cancer Awareness" Blue Rubber Bracelet Wristband - Adult 8"
Better take colon health seriously as this Colon Cancer Awareness blue rubber wristband continues to increase in sales month over month. Show your support to find a cure for colorectal cancer, buy the "Colon Cancer Awareness" Blue Rubber Bracelet Wristband in Adult 8" (universal fit) size. Our Colon Cancer Awareness wristband is made from durable seamless 100% silicone rubber, and packaged in an individual polybag. Made from 100% quality Silicone Rubber for years of enjoyment and promotion of your cause. You may wear this item 24 hours a day including in the shower, at the health club, work, school or even while standing on your head. To clean simply wash with soap and water, our durable inks will not fade easily. Most adults find the "Adult 8" size is best. The "Youth 7" size is best for children up to about age 13 or adults with very small wrists. An adult with very large wrists may find the Adult 8" is still too small, they will have to find another way to express their support of this cause - or use the wristband in a keychain or around a beverage container. If you're the type that likes to make absolutely sure about things, download our printable sizing guide, and "try one on." Open this sizing guide PDF, print the page at 100% scale, follow the instructions and you will have a paper version you can try out in minutes. 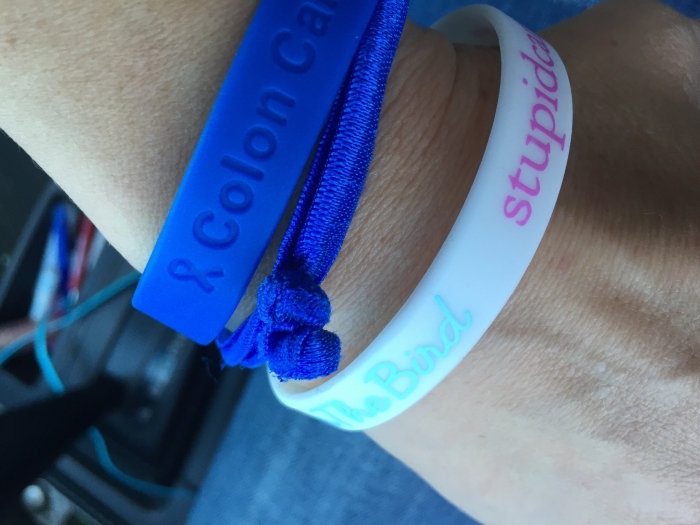 "Colon Cancer Awareness" Blue Wristband White Lettering - Youth 7"
"Colonoscopies save lives - get yours behind you" wristband - Adult 8"
I ordered several wrist band and was very satisfied with the product-shipping and communication. I would definitely order from Support Store again. Bracelets are just as shown. Very pleased. Unfortunately, this is my second order for a specific awareness bracelet. In spite of the need to order, the ordering process is very simple and promptly arrived! My family is appreciative. Shipped fast, was what I expected. These bracelets are made extremely well, and are true to size. I have been purchasing them for years in honor of my late husband, and I have never been disappointed in them. It is also a great way to bring awareness to the cancer type of the color. Best UsesI wear mine everyday to bring awareness to colon cancer., as well as my family. I started with this when my husband was first diagnosed, then I had them as a handout with funeral cards when he passed. I hope it makes other people aware of colon cancer and take precautions with early testing. These bracelets are perfect! Just the right color I wanted and just the right size. I will be ordering more. I want to give more to my family and friends since I am battling colon cancer.